This topic contains 14 replies, has 14 voices, and was last updated by impactgz 8 years, 2 months ago. I guess this is what those whackos do when they’re not trying to defend themselves from factually-correct terrorism charges on the news or setting back invaluable cancer research. Frightening group of crazed whackos. One of my favorite PETA moves was when they asked Yasser Arafat to try not to harm any animals in his suicide bombings. (We all know he fully supports terrorism.) You see the Palestinians tried to send a donkey (guess they couldn’t find any jihadists that day [} ]) into Israel, but it didn’t go and blew up without harming any innocents. Here’s the actual letter itself and the link in case you don’t believe me. I am writing from an organization dedicated to fighting animal abuse around the world. We have received many calls and letters from people shocked at the bombing in Jerusalem on January 26 in which a donkey, laden with explosives, was intentionally blown up. All nations behave abominably in many ways when they are fighting their enemies, and animals are always caught in the crossfire. The U.S. Army abandoned thousands of loyal service dogs in Vietnam. Al-Qaeda and the British government have both used animals in hideously cruel biological weaponry tests. We watched on television as stray cats in your own compound fled as best they could from the Israeli bulldozers. Animals claim no nation. They are in perpetual involuntary servitude to all humankind, and although they pose no threat and own no weapons, human beings always win in the undeclared war against them. For animals, there is no Geneva Convention and no peace treaty—just our mercy. If you have the opportunity, will you please add to your burdens my request that you appeal to all those who listen to you to leave the animals out of this conflict? We send you sincere wishes of peace. Ingrid dear, I don’t think Arafat wants peace. He turned down a deal that would have given him 95% of what he wanted (everythying except Israel’s destruction) when he had no bargaining power and started an intifada instead. Please put down the crack pipe and slowly back away. If Yasser Arafat really thought animals owned weapons, he would’ve been smuggling them in through those tunnels to Egypt a long time ago. I have a very defensive friend who lives near PETA HQ and he makes it clear that most of the community despises them. Easy to see why! We watched on television as stray cats in your own compound fled as best they could from the Israeli bulldozers. PETA’s attack on Michael Moore is a bit absurd. You won’t get fat off lean meat or skim, 1%, and 2% milk/cheese. How about french fries and potato chips? Or vegetables soaked in margarine. Some people make the vegetarian lifestyle work, but I like filet mignon, chicken caesar salads, and bratwurst and hotdogs and I’m not tipping over any flatbed trucks. With any eating style you can eat too much or too little. Nothing more annoying then twisting the truth to get publicity and advertising. Good point Keno. I didn’t notice that point when I read the letter. I guess there were enough other outragious claims that I missed that one. Support terrorists. Vote Bush out of office. 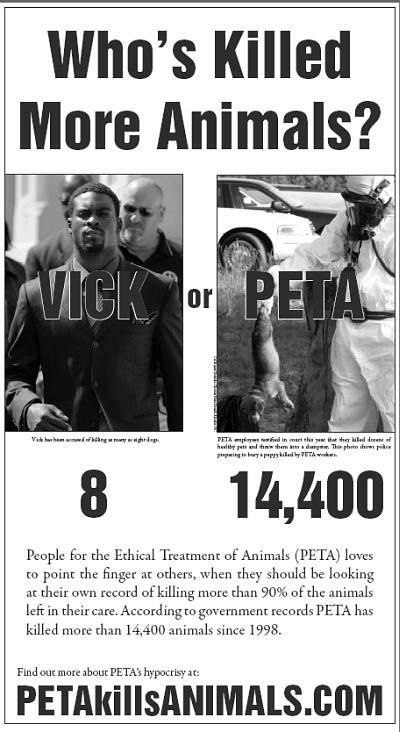 PETA is so bad that other non profits pay for TV ads to urge people not to give them money. Can’t say that about too many non profits, huh? here’s my reply to shelly, manager of mail div. of PETA. I think PETA is confuse, more like in a manner: which comes first: chicken or egg?? There is no need for you to explain your campaign for animal rights protection. There is no question to your crusade. Your campaign and principles are absolutlely just and appropriate. Abuse and unnecessary killing of animals are absolutely not acceptable and definitely must be stopped; just like the mis-use of natural resources, etc. Animal rights must be taken seriously as Human Rights and environmental awareness. However, I disagree to the behaviour of some of PETA members which is damaging to the organization. Part of human rights is to have the privacy and to live in peace on your everyday life. Being thrown with pies or spurted with water guns by total strangers when you are walking to work, doing errands and just doing your own peaceful thing is definitely not funny. It is offensive, aggresive, insulting and impolite regardless of one is wearing. Will you do the same for those wearing immoral clothing or those out naked??? Do the poor people have the right to be aggressive to rich people flaunting diamonds, expensive cars,etc…. Are cops have the right to insult in public traffic offenders? Do we have the right to ridicule the amish people? etc. The point is showing hatred and disrespect is not the right way to fight for a cause. To encourage acts of mockery is juvenile and irrational. Maybe for you it is funny but not to the majority. The three stooges is a show – and people are aware of the antics; and it is intended for a comic relief. To make a point, throwing pies or any food, throwing toys or any acts of mockery or contempt, etc. to pets or any animals are not close to being funny either. However, I am not only referring to this encouraged “funny” acts of various ways of PETA. It is disgusting to see those VIOLENT acts of your activists like bludgeoning people with baseball bats or use of physical attacks. PETA should seriously look into this matter and educate over reacting and melodramatic members. This act is way out of line and over the top. Respect, consideration, discretion, diplomacy and freedom of choice are some of the important values one has to practice at all times of people in different walks of life, people with different views and beliefs. PETA is not exempted from practising these values in expressing their opinions and making a strong stand on what you are fighting for. If you resort to these funny antics you call, and more so to violence, then you are not far from being terrorists. TERRORISM never succeeds. I suggest you start protesting at the face of the source, like the factories and manufacturers…. not the poor individuals who like you – PETA people – are expressing their own beliefs, passions, likes and dislikes, opinions, principles, etc. TO EACH HIS OWN is a very ambiguous phrase but it is still “politically correct” to be observe. And PETA must find a peaceful, civilized and intelectual way to protest as this will call for more respect and admiration and in line with their crusade against animal cruelty. This is written in behalf of WOODY -our adopted dog and to those who were caused inconvenience by animal rights movement. Thank you for contacting PETA about our various ways of protesting the wearing of fur. PETA is an advocacy organization that educates the public about the horrors of animal suffering through entirely nonviolent means and we encourage our members and supporters to do so as well. Vaudeville pie-throwing etc. à la The Three Stooges can hardly be considered violent; better-natured recipients have even been known to laugh it off and crack jokes. Unlike our pie-throwing stunt, however, there’s nothing funny about what the fur industry does to animals. Animals raised for their fur are confined outdoors to tiny wire cages for their entire miserable lives. Suffering from anxiety-induced psychosis, these animals pace and shiver in their cages, chew on their own limbs, and throw themselves repeatedly against the cage bars in a futile attempt to escape. When it is time for their fur to be “harvested,” they are gassed or anally electrocuted, or their necks are snapped and worse. More than half of the fur purchased in the United States is imported from China, where these animals are skinned alive (http://www.FurIsDead.com/feat/ChineseFurFarms). Fur trim that appears on garments featured in magazines such as Vogue is ripped from animals, including cats and dogs, who are bludgeoned, hanged, bled to death, and strangled with wire. This fur is often deliberately mislabeled and exported to the United States to be sold in retail stores (http://www.JCruel.com/catdogfur.asp). Please take a moment to visit http://www.FurIsDead.com to learn more about our campaign against fur and to find out what you can do to help. I hope this information is helpful. Thanks again for contacting us about this important issue. I admire your conscientious efforts to save the animals from cruelty and negligence. I love animals and understand the need to protect them like any human being. However, i don’t admire and even find it hypocrite and extreme the manner on which some of your activists carry out your fight and stand for ethical treatment of animals. You must stop those PETA activists physically hurting people wearing fur or anyone who violates PETA’s campaigns. You must remind your activists that there is also a thing called human rights!!!! To resort to violence to fight for your stand will not call for respect and admiration. Hopefully PETA reminds itself to respect above all mankind!!!!! i also have a hard time with animal testing, but i guess if it could lead to a cure for AIDS or cancer or something like that it would be worth it. This is a great thread. I hope more people see this. PETA is a worthless organization.